Since winning five of six games from July 10 to 14, the Chatham Anglers (15-15-2) have lost three-straight. The A’s aim to snap their three-game losing streak in a Thursday evening matchup with the Brewster Whitecaps (9-21-3) at Stony Brook Field. Chatham’s record dropped back to .500 with a 12-5 loss to the Hyannis Harbor Hawks on Wednesday night. The Anglers now sit five games back of the East Division-leading Yarmouth-Dennis Red Sox in the standings. Over the three-game skid, the Anglers have allowed 25 runs. Hyannis’ 12-spot on Wednesday night marked the most runs the A’s have allowed since their Opening Day loss to the Wareham Gatemen. Austin Bergner (North Carolina) will make his third start of the season Thursday as he tries to halt Chatham’s recent pitching woes. Even with a small sample size, the right-hander has looked like one of Chatham’s best pitchers. Second-year Chatham player Austin Bergner has 14 strikeouts in 10.2 innings this season. Bergner’s summer debut came in a loss to the Orleans Firebirds on July 5. After tossing an immaculate inning — three strikeouts on nine pitches — in the second inning, Bergner unraveled in the third. The Firebirds tallied a home run, double, two singles and two hit-by-pitches in a three-run frame, marking the only runs of the game by either side. The 6’5” hurler brought his best stuff in his next outing, a 5-3 Chatham win over the Bourne Braves at Veterans Field. Bergner used his 95 mile per hour fastball to get ahead in counts before mixing in offspeed pitches to fan eight Bourne batters. Despite the Whitecaps’ league-worst nine wins, they have had success against the A’s this season. The two sides have split four games so far with neither team winning at home. The most recent contest between the sides came on July 17 at Veterans Field, when Brewster knocked two two-run homers in the first two frames to jump out to a lead they would never surrender. 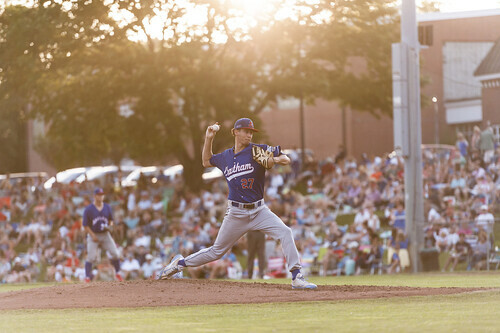 The Anglers gave the Whitecaps a scare, scoring three runs in the bottom of the eighth to make it an 8-6 game, but the visitors held on for their eighth win of the season. Five of Brewster’s nine wins have come in its last eight games. It remains in last place in the East Division but sits just 2.5 games back of Orleans for the final playoff spot. The Whitecaps trailed the Gatemen, 3-0, after five-and-a-half innings Wednesday night but exploded for five runs in the next two innings en route to a 5-3 win.